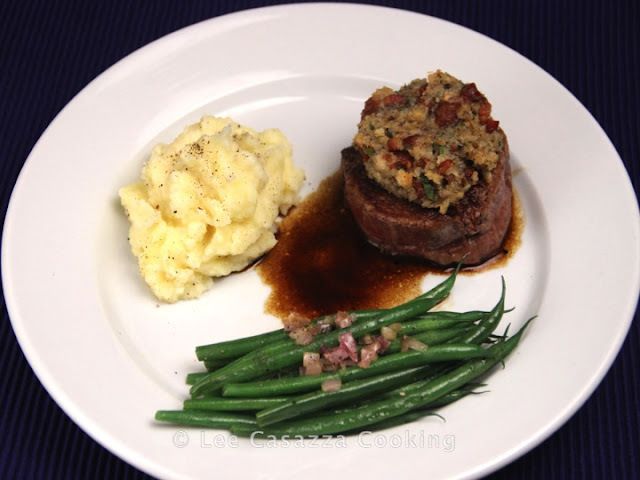 Filet Mignon steaks are expensive and lack a lot of flavor, but they are so very tender. When you find them on sale, buy a couple and make this topping to add tons of flavor to your fillets. This would be a fabulous Valentine's Day Dinner for two. Place bread cubes in a food processor or blender and puree into fine crumbs. In a small mixing bowl, combine 4 tablespoons of the bread crumbs, Gorgonzola cheese, black pepper, and rosemary. In a cast-iron skillet, cook pancetta or bacon until crisp. Heat the same cast-iron skillet over medium-high heat. Add oil and butter and when it is very hot but not smoking, sear the steaks for 2 minutes per side. Transfer steaks to a small baking sheet. Top each steak with half of the bread crumb-cheese mixture and bake in oven for 5 to 10 minutes, to your desired doneness. While steaks are baking, heat the skillet over medium heat. Add the beef stock or broth and reduce by half. Add the Cognac and cook for another 2 minutes. Add the tablespoon of butter and whisk until it is thoroughly incorporated into the sauce. Remove steaks from oven and check with a meat thermometer through side of steaks. Serve with a green vegetable and mashed potatoes.